TdY 2017 – Round Up and Prize Winner! 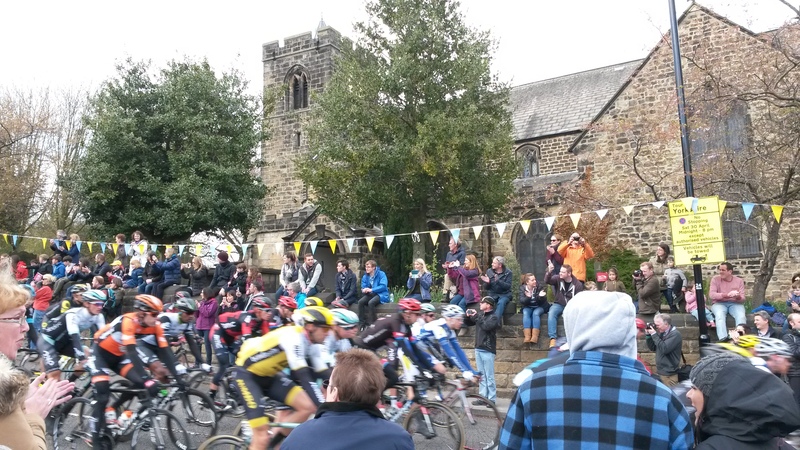 Feast your eyes on the peloton passing St Leonards church, Wortley. 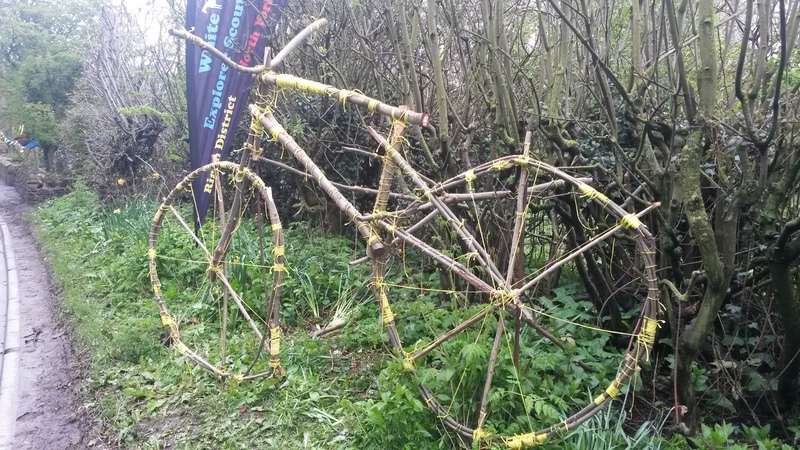 Thanks to Martin Carter of http://www.facebook.com/arfursworld for this winning entry in my #TdY2017Churches competition. 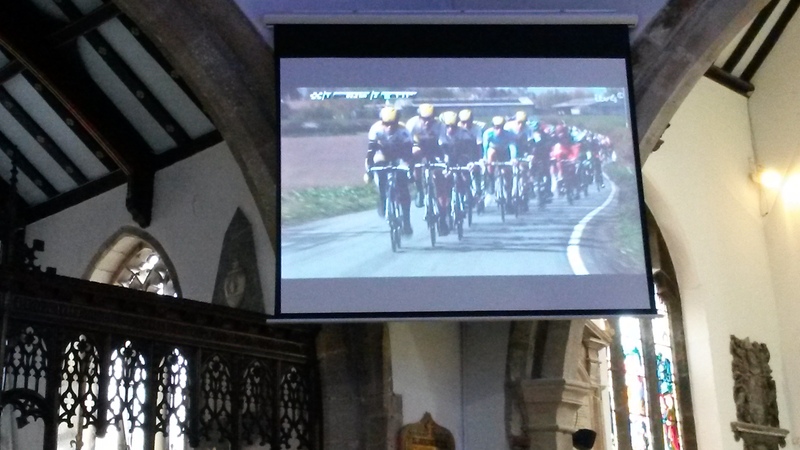 Churches featured well on the ITV Cycling coverage. 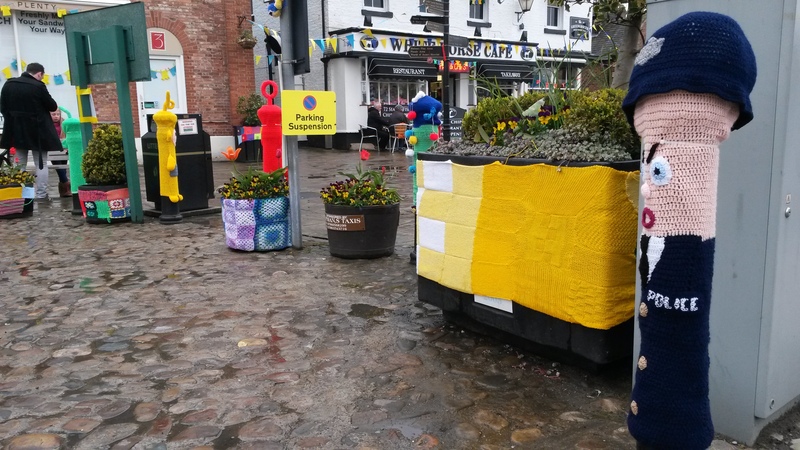 Well done Pocklington for a brilliant yellow jersey on their tower. And well done Norton on Derwent who featured twice on the live coverage; this included a mention from Ned Boulting in the commentary. Their bells were clearly audible on TV. Here’s a couple of photos of my TV screen! First Pocklington and then Norton on Derwent. 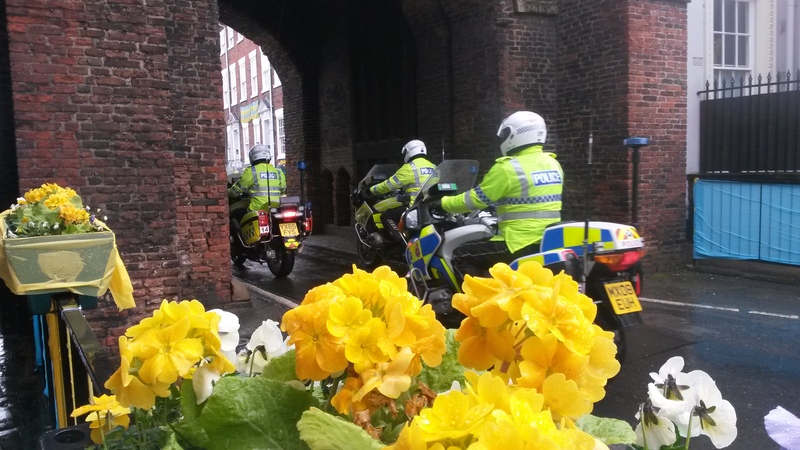 Thanks also to Pickering church for tweeting some great photos of the police motorcade and a table laden with cakes, while their bells were ringing. 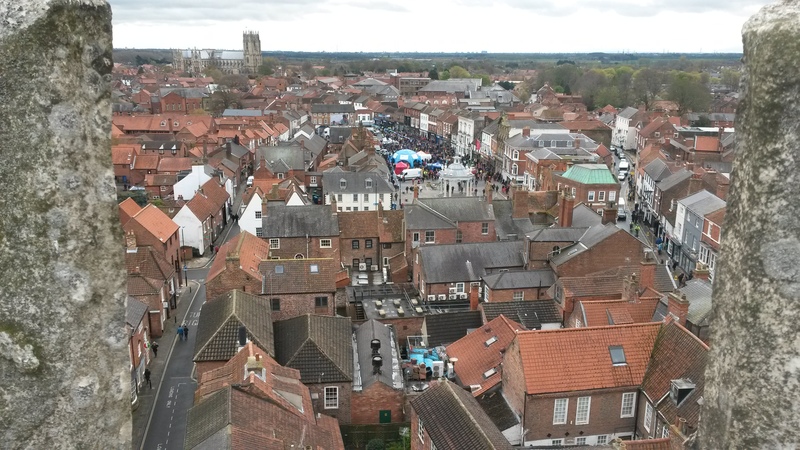 Sympathies to Great Driffield who arranged a brilliant mini-ring for the public to have try on race day, but who didn’t make the TV coverage due to an ad break just as the peloton entered Driffield. 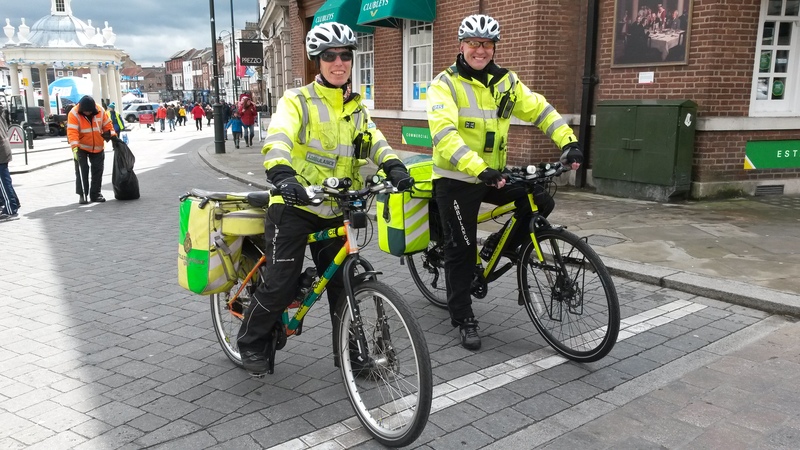 This was a double day, with the Women’s Tour de Yorkshire rolling out in the morning, and the men’s race on the same course in the afternoon. 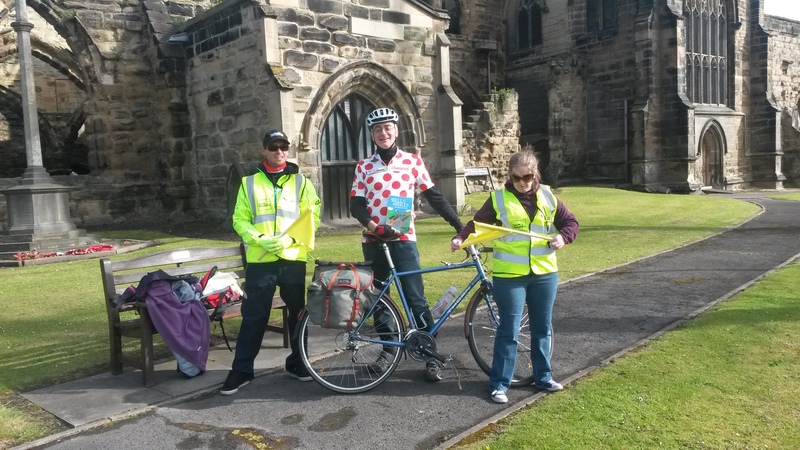 I was delighted to join the local bellringers at Tadcaster to ring for the Women’s race, Knaresborough in between the races and then Harrogate St Peters for the sprint finish of the Men’s race. 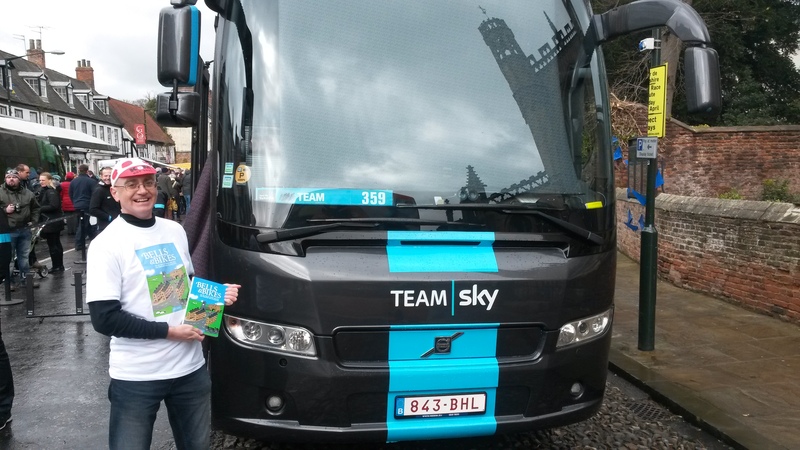 Delighted to meet fellow Tour de France fan @41TourStages on the way! And finally St Peters, Harrogate. Here we see the church tower followed by the band watching a live feed of the TV coverage on a laptop. This helped us time our ringing. Further down we see the view from the tower window (with the race road in the distance) and then the obligatory photo of my book by the finish line! This stage was always billed as the decider for the race victory, with an incredibly tough final 20km from Wortley to Fox Valley, Stocksbridge, including parts of the infamous Strines roads. I’d been torn between the magnificent churches of Wortley and Penistone for months and am excited to share images of both here. But on race day (with five minutes between them) I could only ring at one. 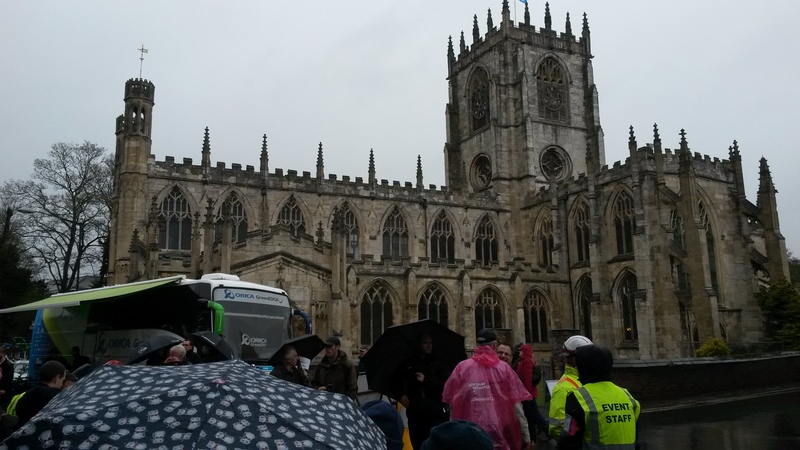 I had been interviewed by ITV at Penistone back on 2014 to announce church bells for Le Tour de France and so I was honoured to be able to join their band again this year to ring as the Tour de Yorkshire came to town. 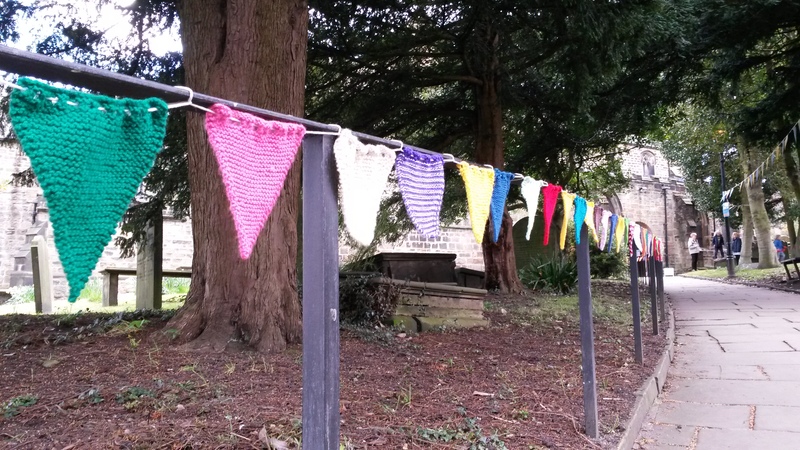 Here we see the crop top bunting of Penistone St Johns and then the fabulous banner of St Leonards, Wortley. 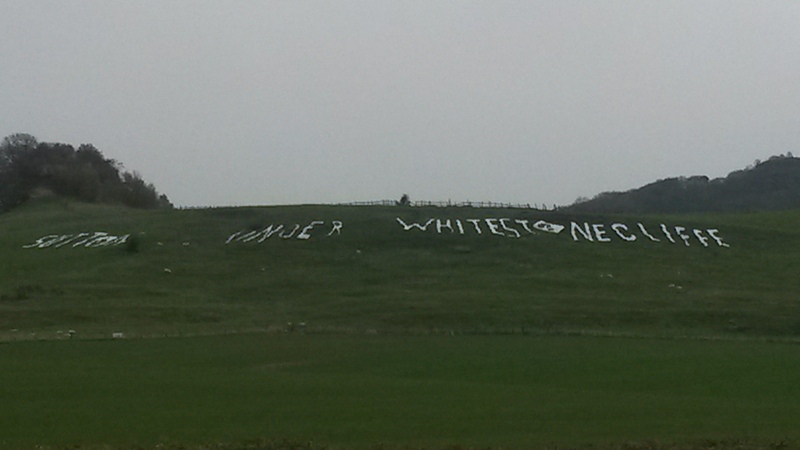 Penistone had previously had a larger banner (as seen further down this page) but the vigorous local weather conditions meant a crop top version had to be applied in the end. Brilliant nevertheless. 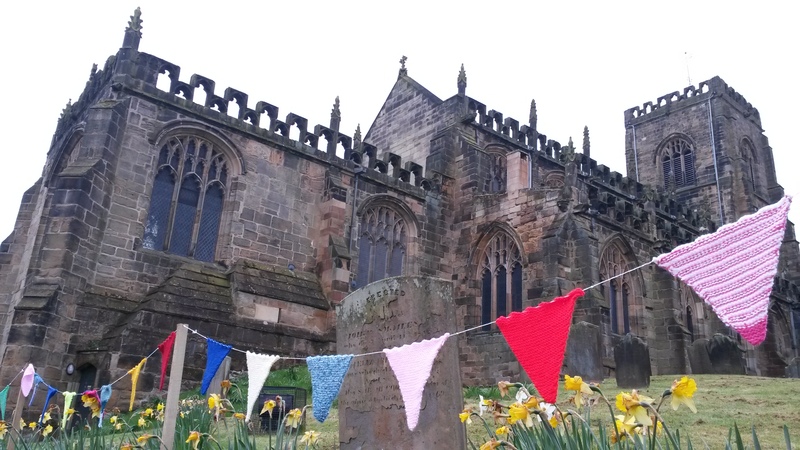 Five photos of Penistone – the church and its decoration, the fans from above (@steelibobs in hi-vis) and me on the roof in polka dots. And here’s Wortley. The best photo, of course, being the one which was the prize winner right up at the start of this page! On the rest of this page I share some church news about the build up to the 2017 race and some highlights from 2016. 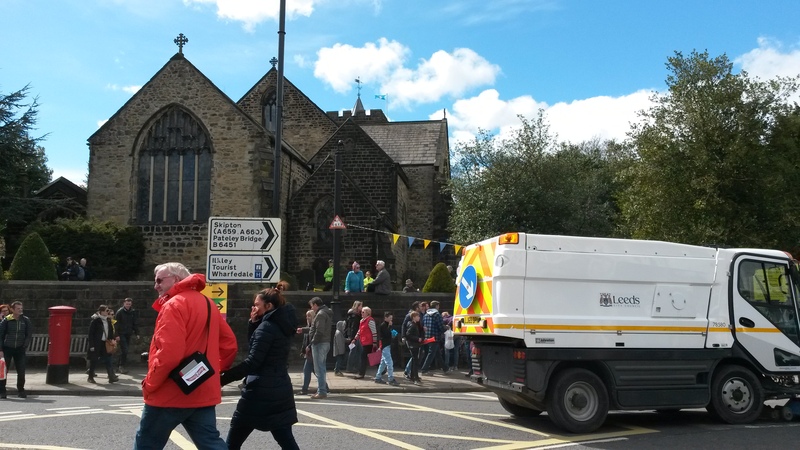 Churches and communities across the county have done a stonking good job preparing for this year’s race. Click HERE for my list of churches that are on or close to the Tour route. 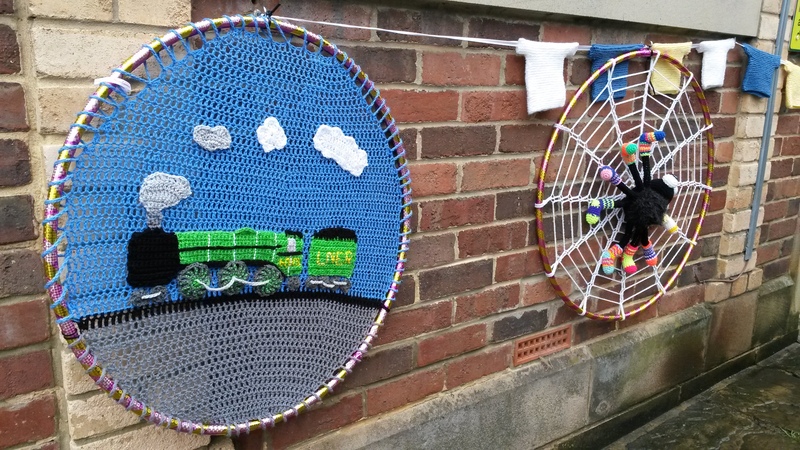 Bunting makers in village halls have been hard at work, paint shops have been spraying old bikes and bands and choirs have written and practised their pieces. There’s a lot to look forward to. Wortley church has the most amazing banner down its tower and around its clockface. The bells will be ringing there for the race on Sunday. And here’s Penistone St Johns. 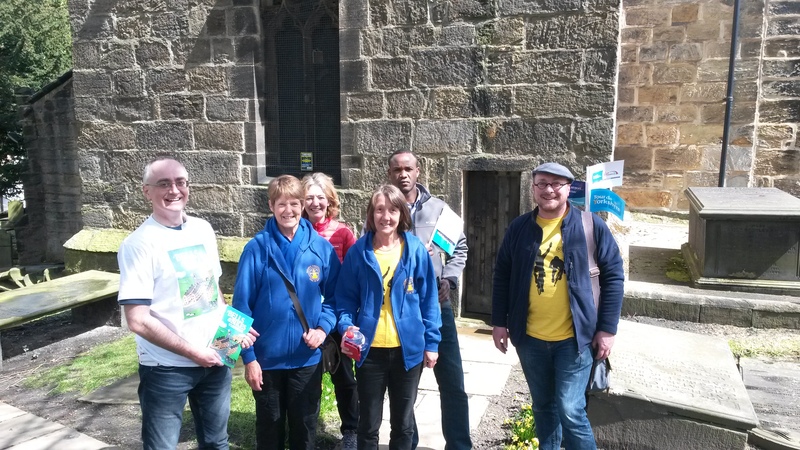 Both churches have been kindly helped by an abseil team from Woodhead Mountain Rescue! 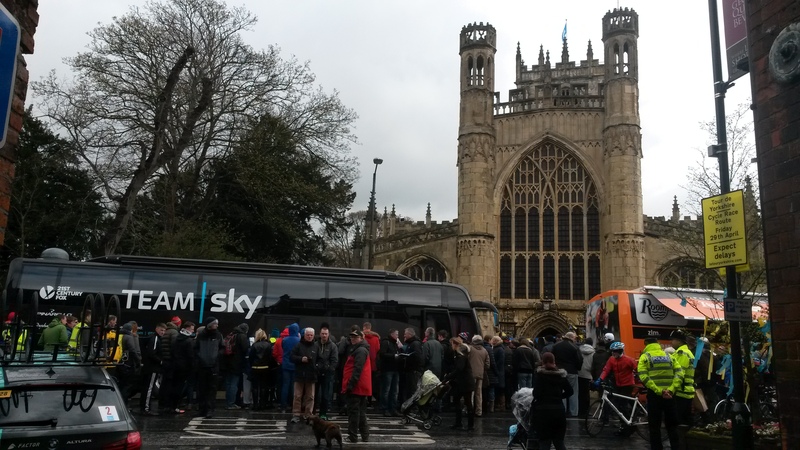 They have both received visits from Sir Gary Verity, CEO of Welcome to Yorkshire, and Christian Prudhomme (Tour de France Director). I note forty nine churches in total and I estimate that fourteen towers are within 20m of the race route (eg. Pocklington, Kirk Deighton, Penistone and Wortley). Many many more are definitely within earshot and are photogenically placed for the enjoyment of roadside fans and helicopter TV crew. Please do have a look at the document above and let me know how you get involved. 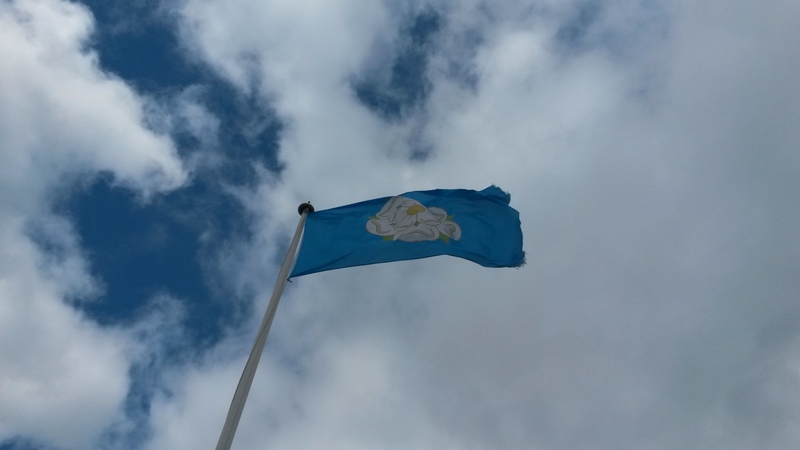 Did you fly the Yorkshire flag from your tower to attract the TV cameras? Alternatively did your community have a nice field or roof top where you were able to show off some large scale attractive artwork for the helicopters to zoom in on? 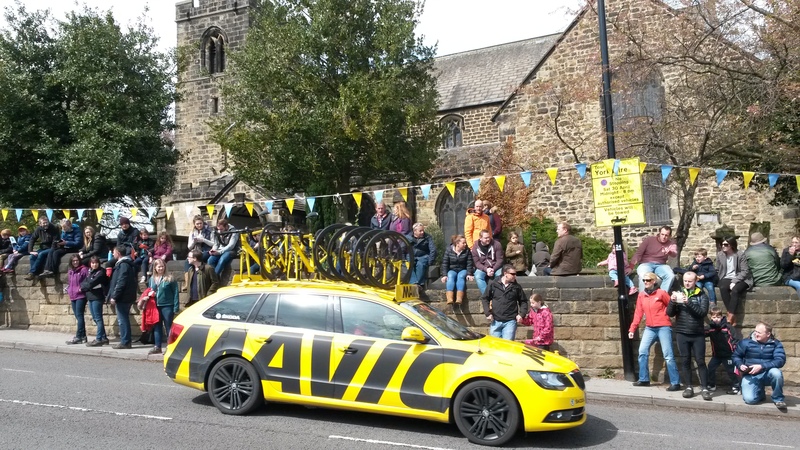 For now, the rest of this page is my blog from the 2016 Tour de Yorkshire. 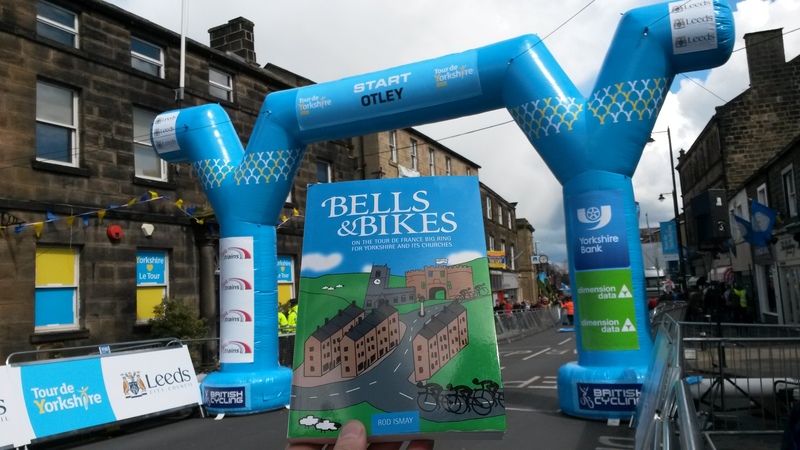 If I had to distill the 2016 Tour de Yorkshire into 3 photos (one per stage) it would be as follows – Northallerton bellringing for Stage 3, Otley bellringing for Stage 2 and a detour to meet Christian Prudhomme while encouraging the crowds to have a go at bellringing for Stage 1 in Beverley. Here goes…. Now in a bit more detail for each Stage…. 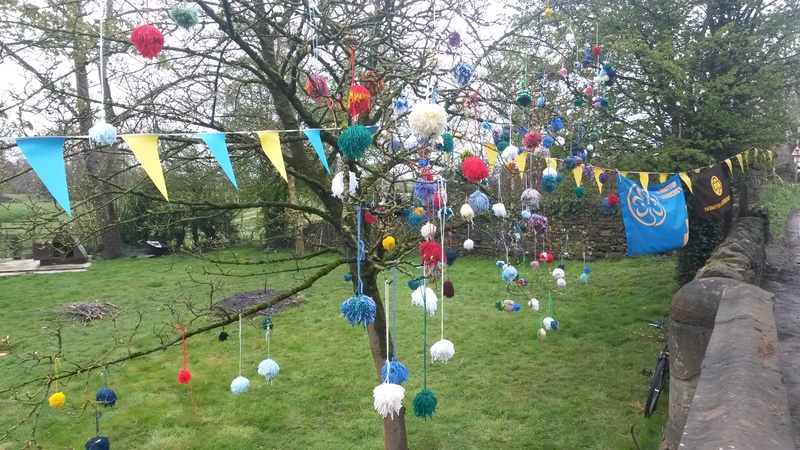 Mixed weather today, but no let up in the roadside decorations. 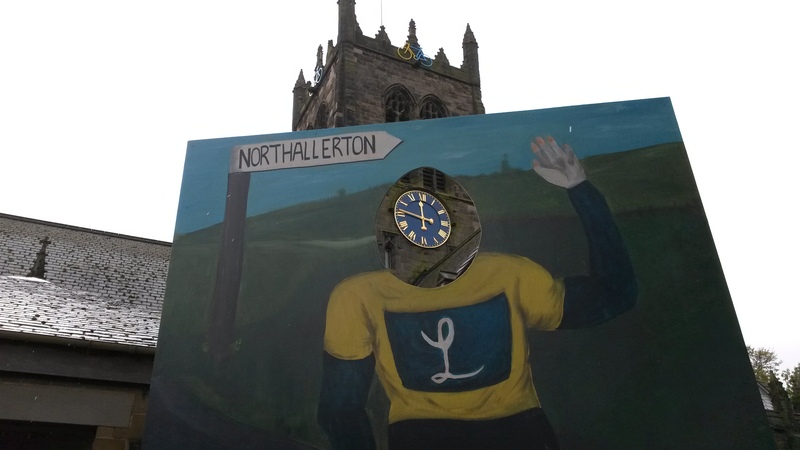 Northallerton moved a whole fairground for the race on the high street, while Sutton Under Whitestonecliffe and Sutton Bank had bunting to rival the 25% slopes of the climb. 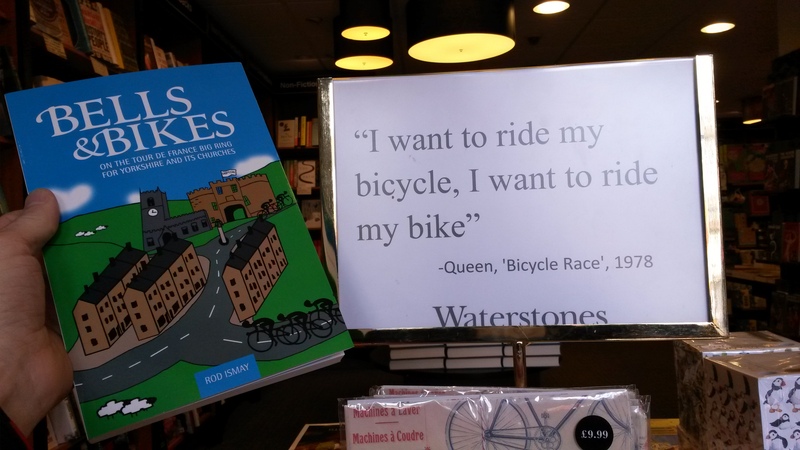 I got my first contact face to face with my book on the shelf in Waterstones – a pivotal moment for Bells & Bikes in Northallerton. The book is also on the shelf in several other branches now including Harrogate, Middlesborough and Sheffield Orchard Square. 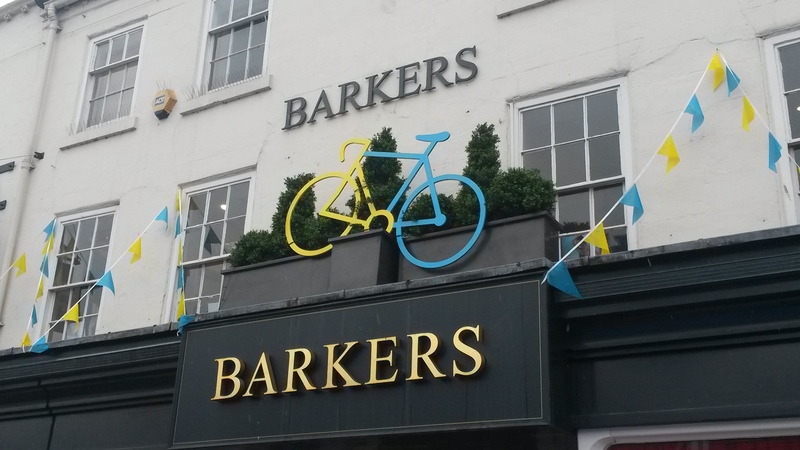 Northallerton had a fabulous set of decorated shop windows. Fatso’s was one of my favourites, but the bike on Barkers was very nice too and the food in the bistro at the back of the department store was amazing. I understand it is *the* place to shop for the folk of Durham and Newcastle. We rang all ten bells for the race. 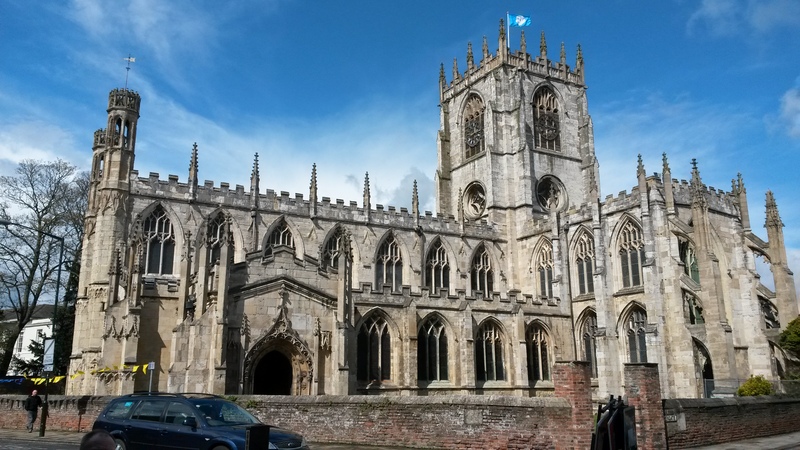 As a town centre church with neighbours nearby, Northallerton has a sound control system in place so as not to make too much noise when it might not be welcome. But for race day the sound control came off. 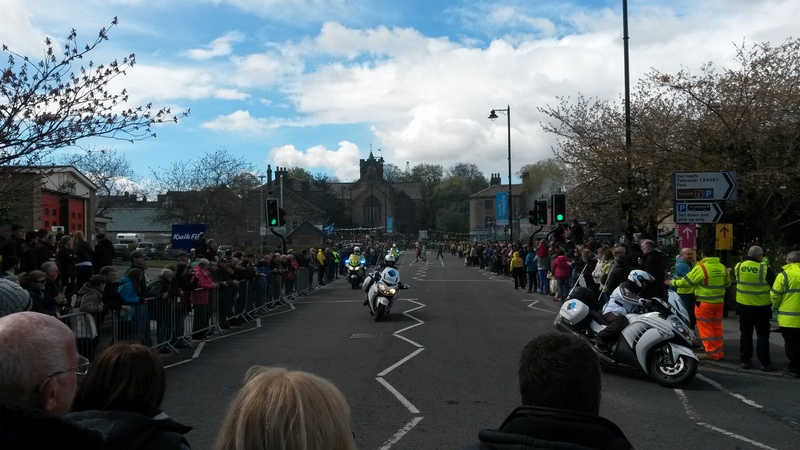 We absolutely roared (or donged) as the riders entered town. I’ve been too busy writing to ring recently so I was a bit rusty – but I was delighted to get through my first touch of Grandsire Caters this century. My delight was multiplied later when I found out that Thomas Voeckler won the stage and the Tour. He’s been one of my favourite riders of recent years and he’s the one who gets more narration in my book than any other rider. Well done Tommy. A Frenchman, loved by the cycling crowds, and who publicly acknowledges Yorkshire as his second home. Ey up bienvenue a Yorkshire. 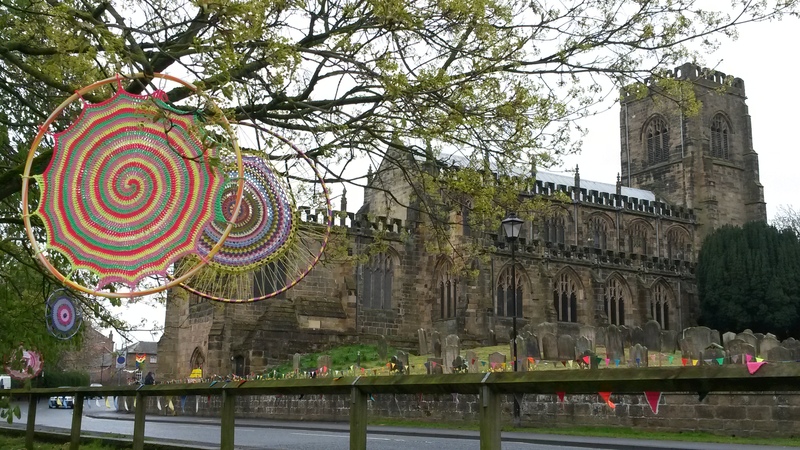 Meanwhile in other news we waved to the Tour Down Under van and we were astonished by the enormity of the yarnbombing in Thirsk. 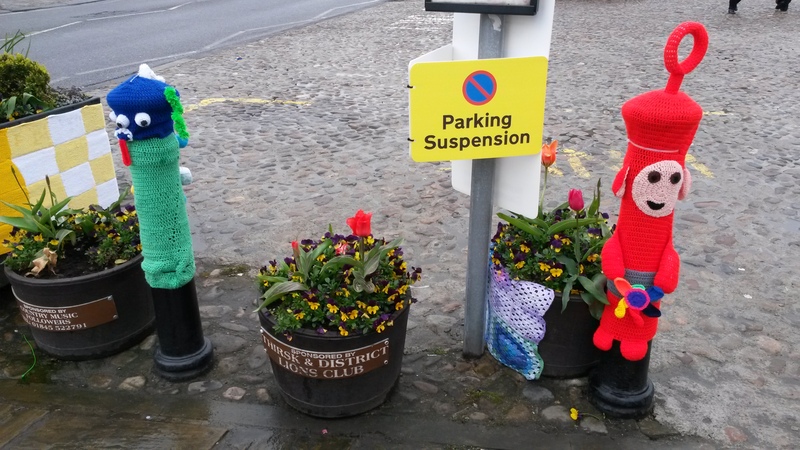 Please do google Thirsk Yarnbombers. Quite remarkable. A selection of images of their work conclude my Stage 3 photos below! No snow today. 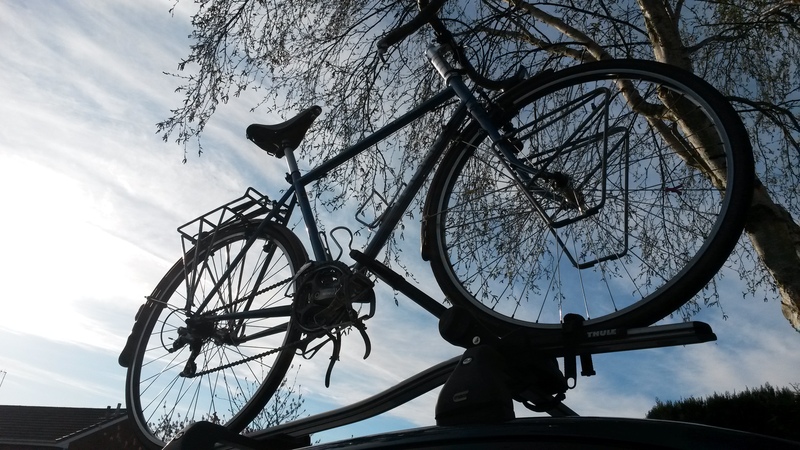 Bright sunshine and perfect excuse to put the bike on the car roof. 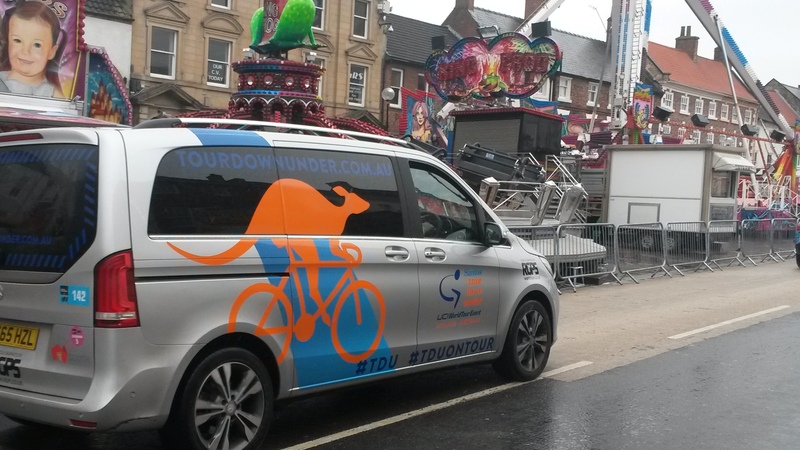 Arrived in Pontefract an hour before the Women’s Race. 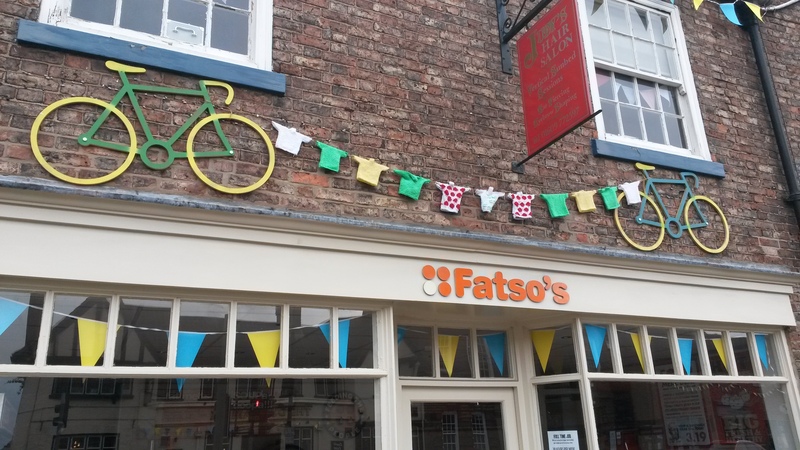 En route, I became more adept at short sharp “Tour de France” hoots on the car horn each time I passed people putting bunting up. I met James and Joanne in the churchyard at All Saints. They were getting ready for their roles as Tourmakers and Marshalls. Photos were essential. Then in dialogue with a bloke on the pavement we realised we followed each other on Twitter. 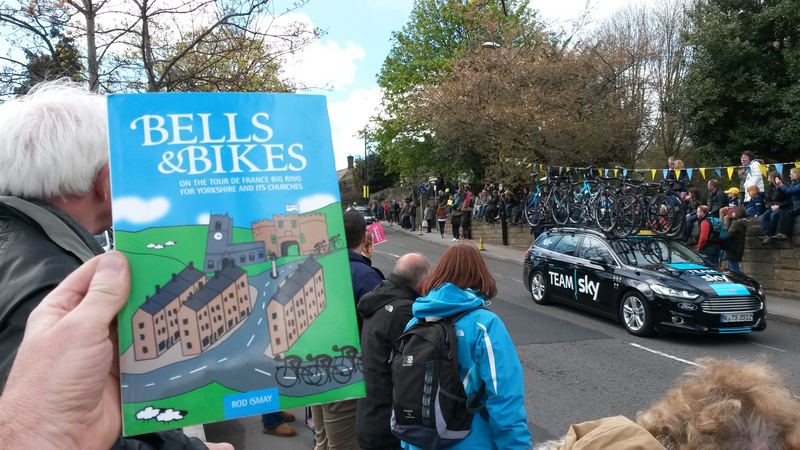 Bells and Bikes meets Yorkshire Reggiie. 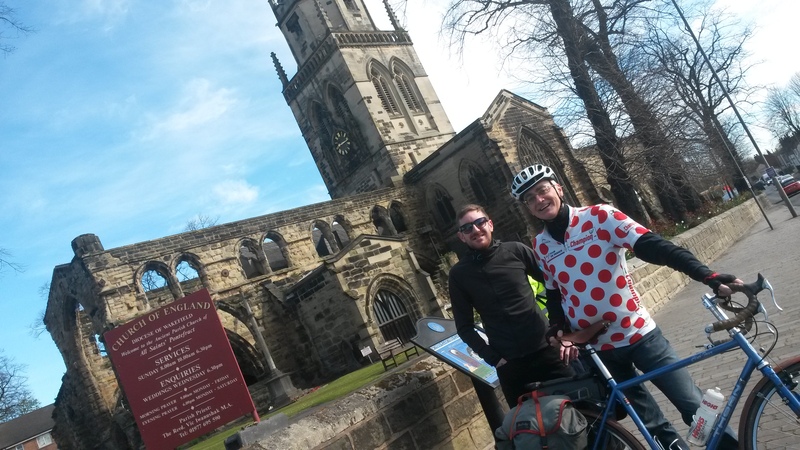 Great chat about cycling and then a quick climb to the summit in Pontefract and a spin in polka dots. By that time the rest of the ringers had arrived and were making their way to the tower door. I was lagging. I saw another bloke on the pavement whom I had to visit in light of his big blue Yorkshire cape. It turned out to be a flag and he turned out to be the brother of a ringer I know and much twitter dialogue ensued. 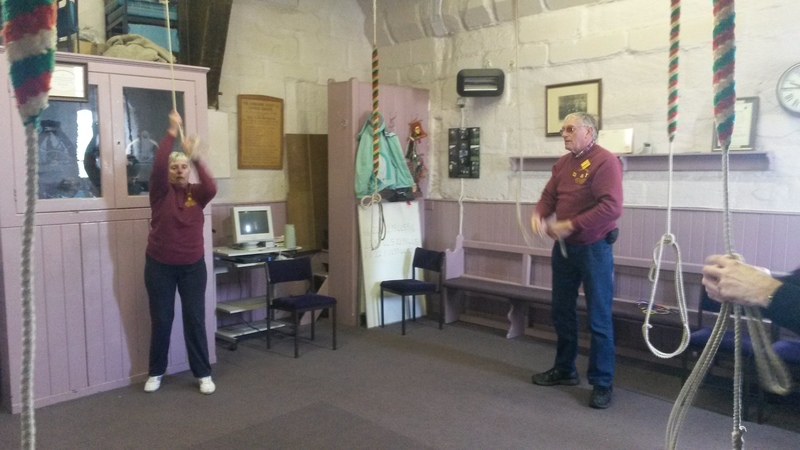 In the meantime Knottingley ringers started tweeting too and somehow I featured in Yvette Cooper MP’s timeline. We did some nice call changes as the Women’s Race zoomed by. 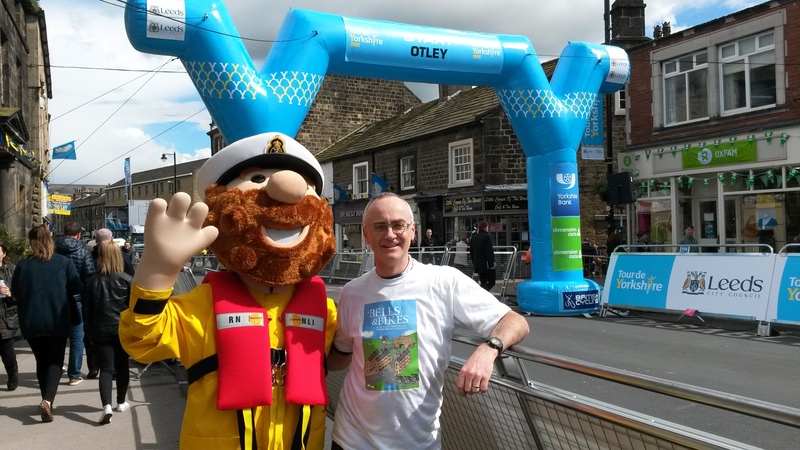 Then (with a detour to Knottingley ringers, photos, cakes and coffee) I was off to Otley to ring for the Mens Race. I parked in Leathley, a small village about 4 miles from Otley, with a church which rang for the Tour de France Opening Ceremony. I loaded all 4 panniers onto my bike (2 front and 2 back) and proceeded to tweet my way into Otley with 27 books on board. I cheered the families at their picnic tables as I cycled along and they cheered me. Just like the race. I hadn’t seen the Otley ringers since March 2014 when we recorded the BBC Songs of Praise Tour de France edition but they were just as lively as I remembered. A great band. A pleasure to ring with. We did some more fine call changes and then out to see the race. 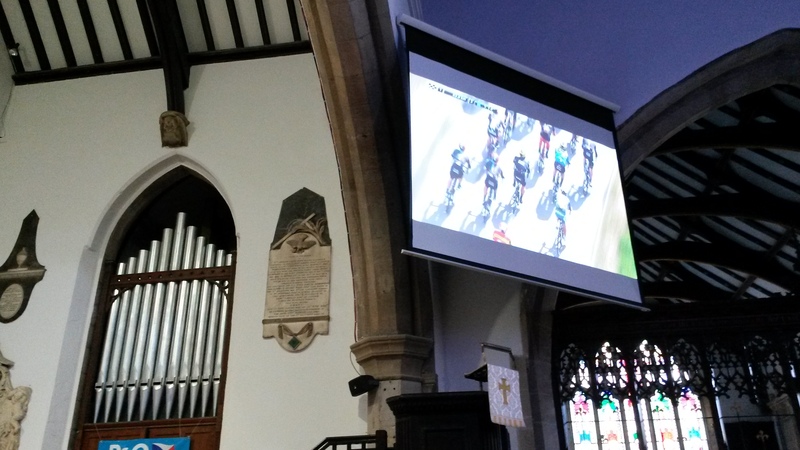 Otley All Saints church had big screen TV inside. Perfect. A good second stage. Selection of photos below. Meanwhile the races ran their course and their results are well documented by experienced commentators better than I. But they don’t have the story of the bells! #scoop. See you on Stage 3 for more action. 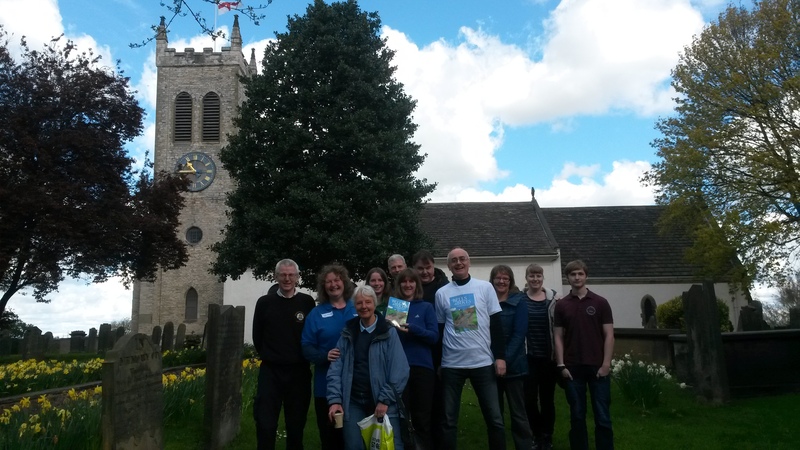 Ringing in Northallerton on Sunday. After driving through a blizzard on the Cote de Oughtibridge and road closures in Howden, we arrived at a windswept Bishop Burton Park & Ride to get the bus into Beverley. 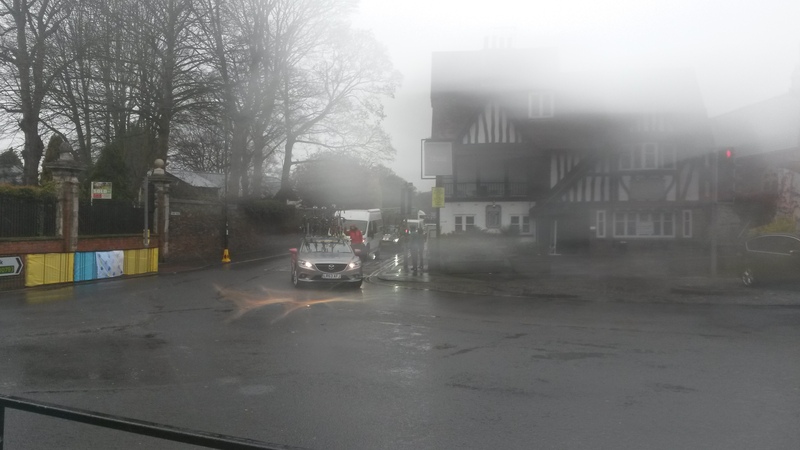 My camera phone was quickly drenched taking photos of the police motorcade at “North Bar Within”, the iconic archway into Beverley. After what seemed a chilly eternity we reached the warmth of St Mary’s Beverley. The OneProCycling Team knew about the ringing. 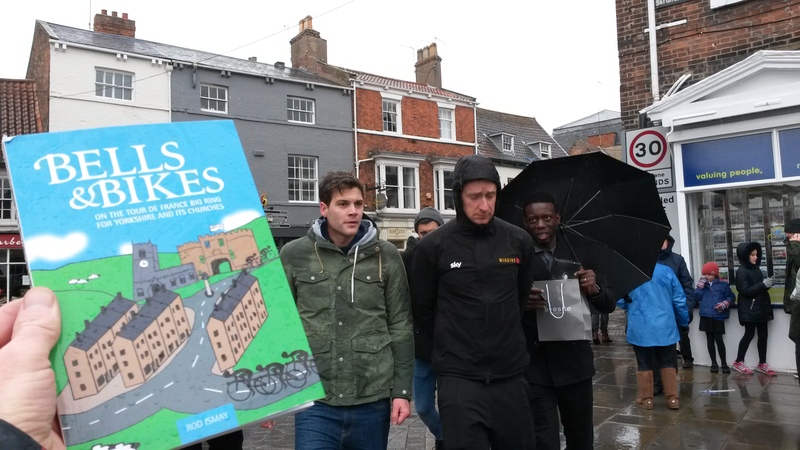 However, while Sir Bradley was within earshot of the bells in Cafe Velo Bev, he was understandably focussed on the race not the bells today. 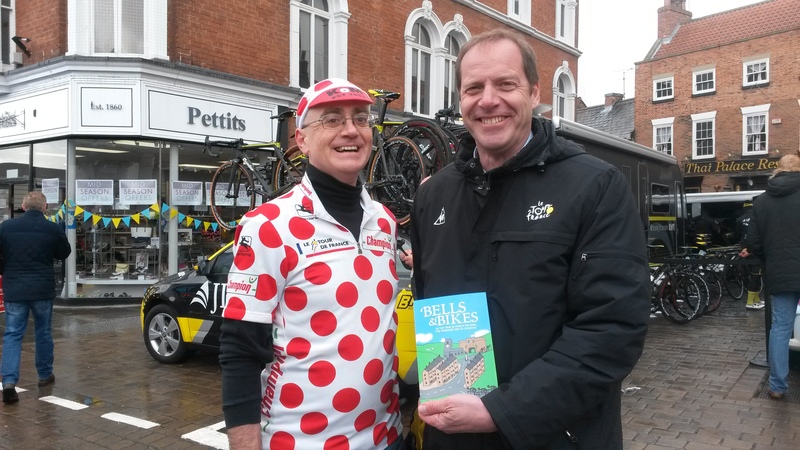 So while I got a photo of him near my book I concentrated my energies on running after Tour de France Director Christian Prudhomme to thank him for embracing bells back in 2014. It would have seemed rude to have interrupted Brad in the final hour before the race. 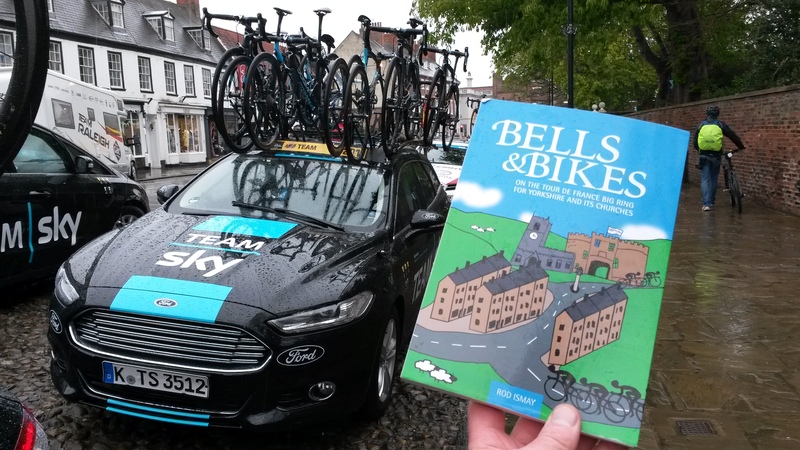 A party of 40 school children tried the mini-ring in St Mary’s, a couple from Cockermouth who cycle and ring bells recognised me from the back page of The Ringing World and I got my first book sale of this year’s race. Another book got drenched as I took photos of the team buses. Shrinkage and spoils, I think they call it in retail! My fingers were too cold to hold the pen as I signed the book but somehow it all worked OK.
At 11:45 we started ringing the tower bells of St Mary’s and across the town a fellow band rang the bells of the Minster. 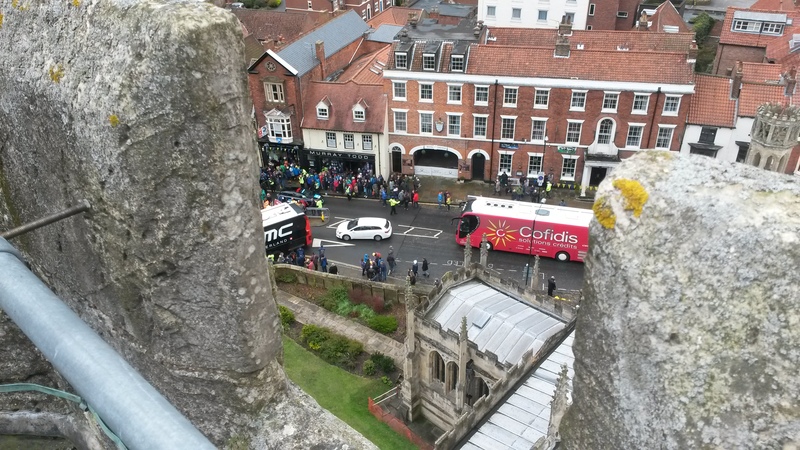 Afterwards it was amazing to stand on the roof of the tower looking down on the crowds. Many many more things happened, some of which I am afraid I just cannot tell you. I had the chance to help the organisers with something for the rest of the race. Another story for another day perhaps. 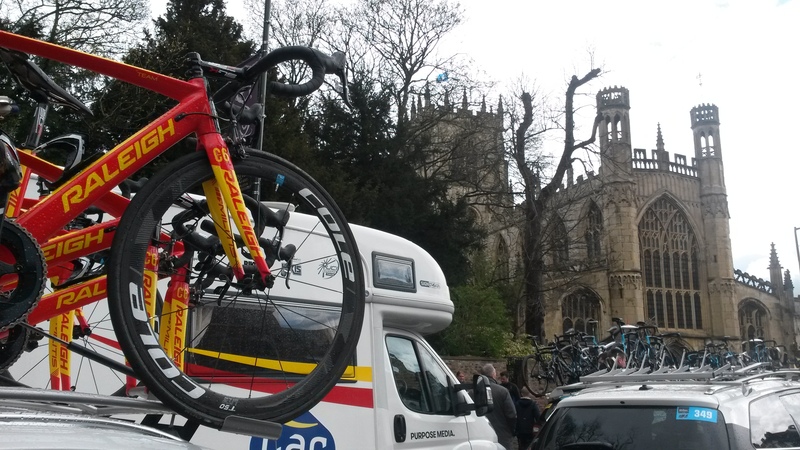 Stage One of the race was won by Dylan Groenewegen in Settle. 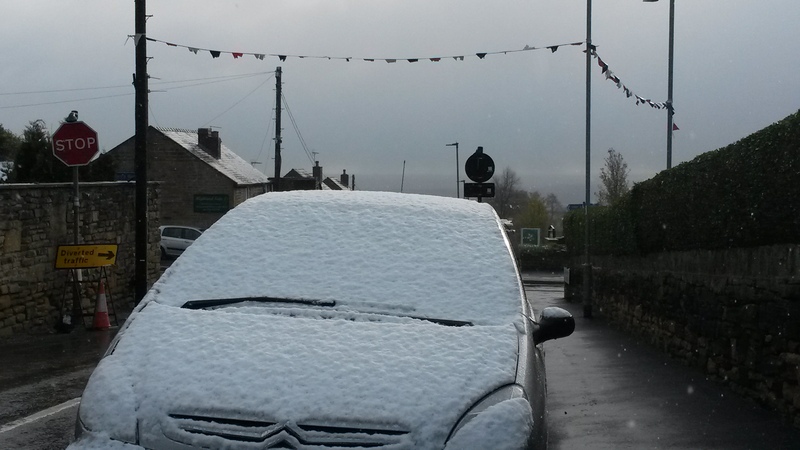 The bells rang out in Settle too. All was well. Full race results for Stage One can be found via the official link below. I will close this section with a few photos of my day and a link to a very short rooftop film on Vine. 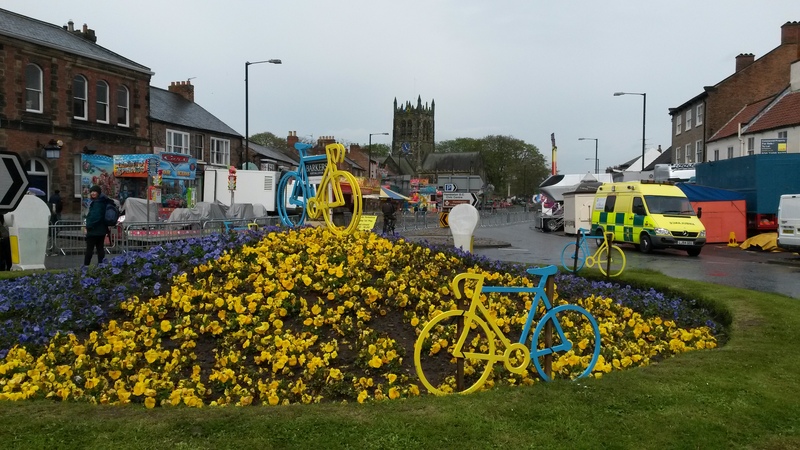 The 2016 Tour de Yorkshire bike race was from Friday 30 April – Sunday 2 May. 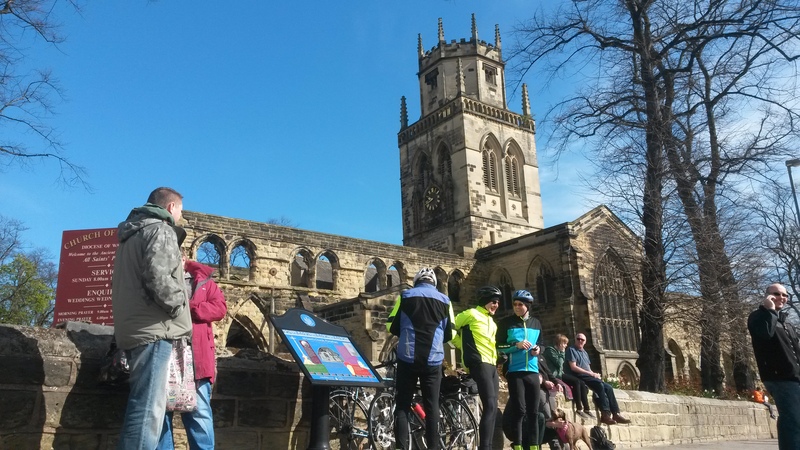 “Bellringers Herald Cyclists” was a formal event in the 2015 Yorkshire Festival. 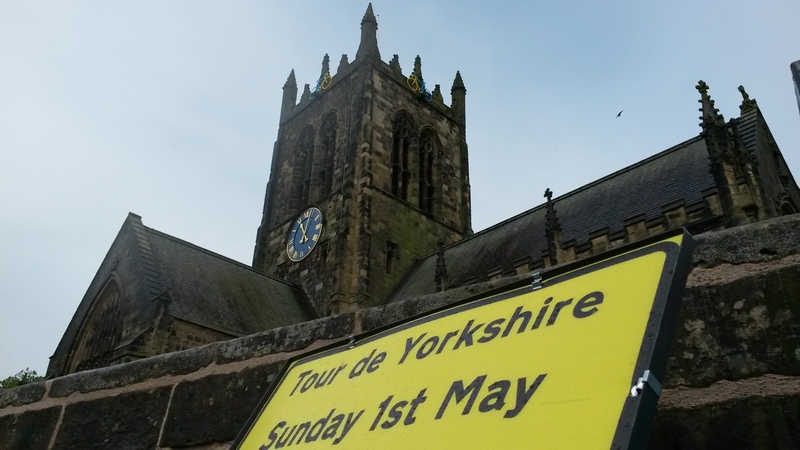 It built on the massive success of bellringing for Le Tour de France in Yorkshire in 2014. 2. 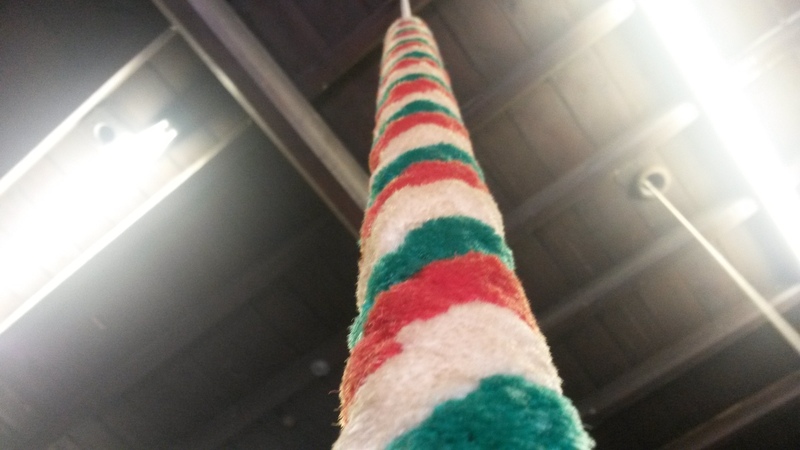 To invite non ringers to come and have a go at our practice nights during the Festival (and indeed outside of the Festival). 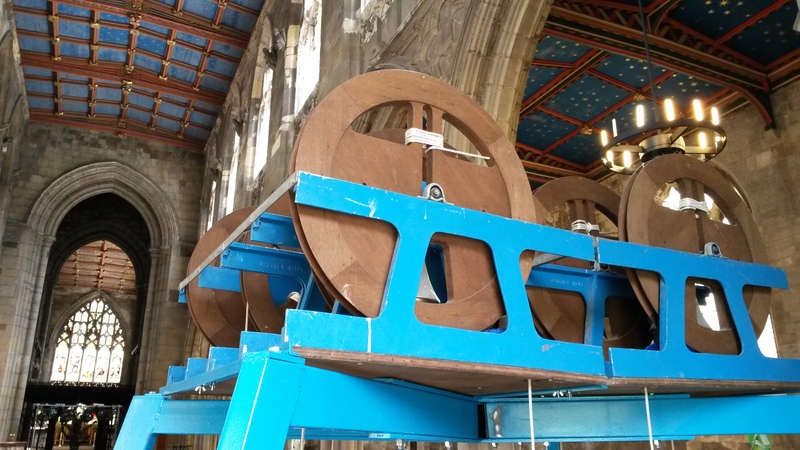 We urgently need more ringers to help keep this wonderful art going and to ensure that there will be enough ringers to ring the bells for all those weddings you want to go to next decade. Please do have a look and let me know what you think. Let me know via this page or Twitter @Bellsandbikes or Facebook “Bells and Bikes” or by email as per the attached file. All entrants will qualify for a £5 discount when buying my book direct from me (add postage). That means instead of RRP £12.99 you pay £7.99 plus postage (£1.54 second class or £1.71 first class). The best entry, in my considered opinion, will win a signed copy free (charge applies for overseas post).